Please measure neck using a piece of string, leaving room for at least two fingers to easily fit between the string and neck. You should choose a length you feel comfortable with. Contrary to popular belief, amber is not a crystal, it is actually 30-90 million year old fossilized tree resin. Amber has been used for centuries for its healing properties. When it comes in contact with the skin, it becomes warm to the touch. 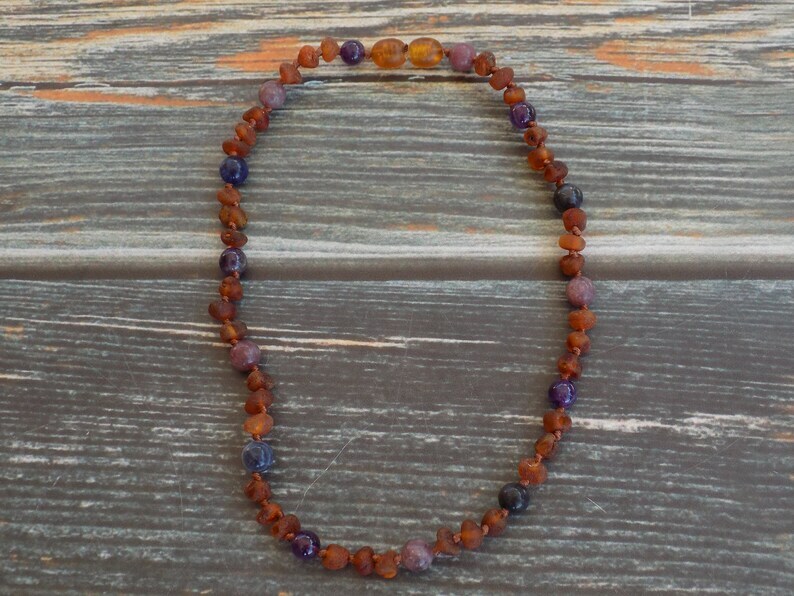 As the amber warms, it helps to alleviate pain, discomfort, fatigue, and generally provide more clarity. The reason for this is the result of the actual makeup of the amber. The resin is actually the protection mechanism of the tree, just like the anti-inflammatory response in humans! It promotes healing and growth in the tree, which is why it is believed to help us with our aches and pains. Sodalite brings order and calmness to the mind allowing release of stressors that hinder our higher selves. It encourages rational thought, objectivity, truth, and intuition, along with verbalization of feelings. Sodalite brings emotional balance and calms panic attacks. It enhances self-esteem, self-acceptance and self-trust. Sodalite balances the metabolism, boosts the immune system and overcomes calcium deficiencies. It can increase physical endurance. It combats radiation damage by soaking up electromagnetic smog. Sodalite helps lower blood sugar and helps cleanse and balance the body’s glands. It cools fevers, lowers blood pressure, and supports the immune system. Sodalite can also help to prevent insomnia. Lepidolite reduces stress and the needless worry. It offers support during live restructuring and reorganization and opens the way for the new. Lepidolite is a stone of transition, encouraging connection with the divine plan and offering support through perceived difficulties. Sometimes, Lepidolite is referred to as mineral kingdom thorazine because it produces a calming effect on the body, reducing insomnia and hyperactivity. Amethyst is a stone of spirituality and contentment and is a powerful healer and protector. Amethyst imparts stability, strength, invigoration, and peace. It is often used during meditation because it conducts calm energy, helping to ease the mind. Amethyst works to enhance mental activity, increasing focus, amplifying thought, and lending strength to control passions and break undesirable habits. Amethyst helps to balance highs and lows, promoting emotional centering It is useful in treating insomnia, stress, headaches, addiction, depression and anxiety and digestion.